To start, a short-ish round with various takes on “doubled” variants. To start off, a Double Coral (35). This was a pleasant solve; it helped to have solved one of these before on the 2018 GP. Next a Double Snake (30) which was also quite fun – the rule conflict with the instruction booklet was communicated clearly enough. For most of the rest of the round, the types switched to a single grid of clues to be distributed over two puzzle grids. First, two Double Skyscrapers (55, 75). For the first, the clues were to be decomposed as sums between the two grids. For the second, additionally complementary buildings in the two puzzles were to sum up to 6 (reminiscent of the two-in-one round from Senec 2016). I got through both well enough. It turns out that the second one might have benefited from better preparation (there’s very limited allowable decompositions). Also this was another of those puzzles with subtle rule differences that caught some people out. Next two Double Latin Squares (10, 15) which I kept for the last few minutes – they were quite straightforward. I’m curious whether it’s possible to make an instance of this type that doesn’t necessarily rely on near-maximal/minimal clues. I didn’t see how to immediately get started on the Double Nurikabe (60). Afterwards, this turned out to be a very worthwhile puzzle; this was one of those choices informed by a lack of trust in the existence of logical solving paths. Next an exception to the theme of doubled grids with a Double Domino (20), which was a standard domino dissection except for the doubled set of dominos. Straightforward enough. Finally a Double Doubleblock (60) which I skipped after the first case distinction failed to get anywhere, and a Double Shikaku (90). The Double Doubleblock fell easily enough afterwards though, even if I didn’t find any particularly nice arguments. And the Double Shikaku kept me occupied for most of the rest of the round. After quite a bit of experimentation, I got to a convincing solution for one grid, but just couldn’t make the other grid work out. 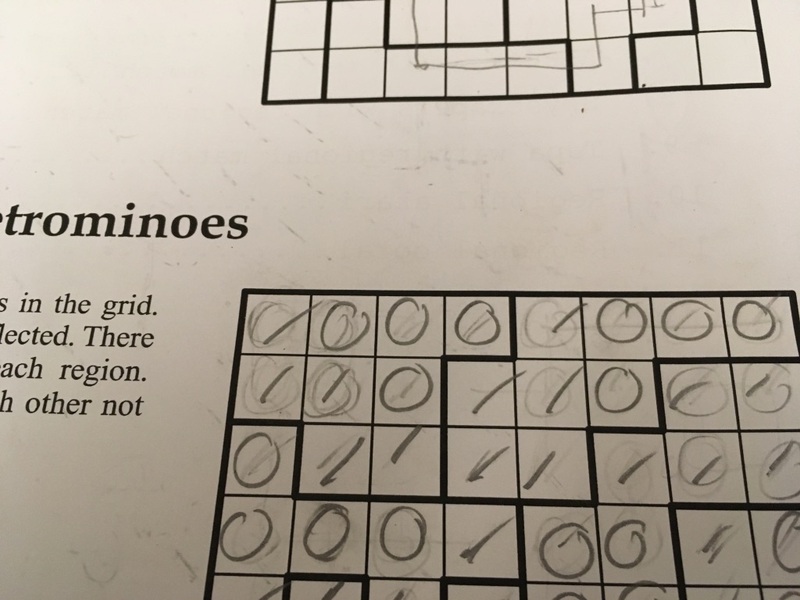 While I might have found the solution anyway, my core error here was missing another of the rule subtleties: It wasn’t just to distribute the clues between the two grids, but also to split each individual pair of adjacent clues. That was a sentence in the rules that I’d missed. It also explains why I gave up on Berni’s training puzzle of the type… Clearly one to chalk up to lack of preparation, but there’s also an element of instruction booklet carelessness here, since the example was uniquely solvable without that extra rule. Altogether this resulted in my relatively worst round, with 64% of 10th best. In addition to the 90 points for the Shikaku, I expect I’d have stood a good chance at having had enough time left for the Nurikabe. Next up a batch of region-based puzzles. I started with the Regional Pentominoes (105), which I’m quite familiar with via Richard, who calls the Pentomino in a Box. This one fell very cheaply when the first of three or four possible X placements turned out correct. It felt like I spent quite a bit more time on the easy sibling, Regional Tetrominoes (30). The Regional Masyu (40) (four corners per region) was a straightforward and unremarkable solve. The Regional Yajilin (95) on the other hand had some very pretty arguments of just the right level of difficulty (for me). Next a Regional Fillomino (65), a bit of a curious variant that suffers a bit from messiness and the heavy type-setting. But also a very nice puzzle. Next a batch of three slightly irritating puzzles, ABC-Sky, Skyscrapers and Tapa with “reginal match” (45, 50, 45). These all consisted of two grids which were linked by some rule stating that certain cells are the same/independent/different. Unfortunately, these linking rules were all subtly different. And thematically, I feel that these puzzles would have fit the Double Trouble round better. As regards the solving, I got through the first two of these cleanly enough, and skipped the Tapa because I knew how error prone it was from trying the example. With not too much time left, I skipped the Regional Akari (40), failed to break in to the Regional Coral (55), flipped back to the Regional Snake (20) at the start of the round and got that one out with a bit of luck. 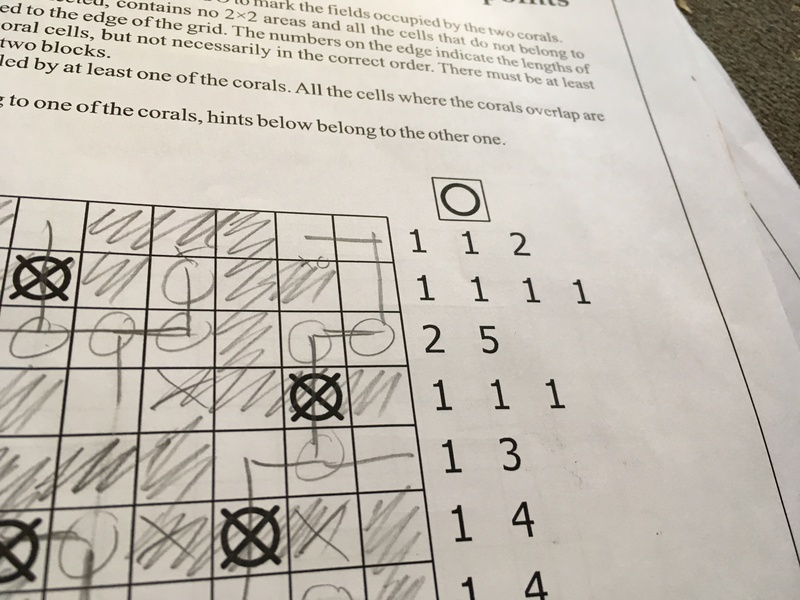 The Akari and Coral turned out to be quite nice puzzles when I revisited them afterwards. At the time, this didn’t feel like a particularly good round, but it turned out to be one of my best at 114% of 10th best. I have some ideas for the reasons, but will wait to confirm those in the future. The final individual round of the day, made up of original puzzle types. I started with the fourth puzzle, Stalagtites and Stalagmites (45), which went well enough. Next a Mirror Labyrinth (45) where my team mate Philipp’s suggestion to just go for the naïve mirror placement and see if it works out paid off nicely. No need to even check the 56 sum. Next up a Coral with Letters (60), a Coral variant that allows for some pleasing deductions. I also quite like the type Inner ABC (40, 40). However, the first competition puzzle gave me so much caseworky trouble that I passed on the second. Next a loop puzzle, ILX (35) which is a neat idea and solved cleanly enough. I skipped the two Point to Numbers (15, 15). The type feels familiar, and the first instance seems to have multiple solutions (only seemingly broken puzzle I found in the whole set). Then two Single Block (20, 40) puzzles (the second one with no diagonal touching); these were fun and smooth solves. I skipped Worms (35, 30), which is a type I’m not particularly fond of. Finally a whole batch of Labyrinth puzzles (30, 35, 45, 80, 35), which make reasonable use of the “worm rule”. Here I had a bit of practice due to Philipp’s practice puzzles, and got through the first four comfortably before time got low. At that point I switched to the beginning of the booklet and got out two of three ABC Letter Groups (5, 20, 20), the second of which was a proper last second rush. Another solid round, and again an unexpectedly good result with 122% of 10th best. The day concluded with two short team rounds. The first was big square grid the combined Japanese Sums (1-9), a Snake and a pentomino placement puzzle in a rather straightforward way. We had practiced this one on a full-size puzzle that Berni had prepared. There were no huge insights in terms of preparation, we mostly agreed on a consistent notation. This one went well enough. While there was some linearity to the solve, I feel that we spread our attention decently over the puzzle, broke in soon enough, and managed to get a decent amount of parallelization when wrapping things up. I believe we finished with 10:30 minutes to go, and chose to check for a bit before handing in with 9:00 minutes of bonus. We came out clean, with what seems to be the second best result after Hungary. The second team round was another large combination puzzle, this time a hexagonal hybrid of Coral and Easy as ABC. This one felt like it went less well for us, since we struggled to break in to the puzzle. I don’t have the exact numbers, but I’d estimate the first break-in took us 5 minutes, and then another 5-10 minutes before finding a second spot to start unravelling things. From that point it went smoothly, and judging by the results, we weren’t too far off: We finished fourth with 10 minutes of bonus, 5 minutes after the top-scoring Japan and close to Hungary and Slovakia. Two fun team rounds, if not hugely inventive (or at least a bit too similar in terms of team mechanics). Though I wish these kind of single team puzzles were printed a bit larger than A3, it’s always a bit hard for everyone to access the grid. That’s it for Friday. Tune back in soon for the two remaining preliminary rounds and the playoffs.